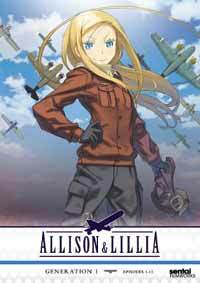 Notes: Based on the light novels Allison and Lillia and Treize by Keiichi Sigsawa, also creator of Kino's Journey. Though this predates Stig's review, his is the first complete review we have, and it thus supersedes this one as the "1st Opinion". This is not our world, but rather, another world, divided roughly into two by a huge river called the Lutoni. To the east lies the Roxcheanuk Confederation, or "Roxche", while to the west is the United Kingdom of Bezel Iltoa, known to most as "Sou Beil". Roxche and Sou Beil have been at war as long as anyone can remember, though an armistice is currently in effect. Though the calendar year is 3287, the technology lags behind our own, with piston-engined airplanes ruling the skies. This is the story of young Roxche pilot Allison Whittington and her childhood friend Wilhelm "Wil" Schultz, a scholar, as they find out about a treasure that could bring an end to the eternal war between Roxche and Sou Beil. This is only the first in a series of adventures that will lead them, their newfound friends, and eventually, their daughter Lillia and her friends around their world. In the real world, stealing planes and gallivanting off on solo missions over enemy territory would've given Allison an instant court-martial, if not gotten her killed outright. This is one of the things conveniently ignored in the fancifully nonsensical adventure series Allison and Lillia, in which military officers are apparently given carte blanche to do just about anything, up to and including an outright coup d'etat, as long as their heart's in the right place. But before you get the wrong idea: against my better judgment, I actually really like this show. It's not because of any technical merit. Visually speaking, this may be one of Madhouse's weakest efforts yet: apart from shots of the planes and some of the scenery shots, the art is very simplistic and undetailed, particularly regarding the characters. Ten years ago, this would have been an average series, but now, it looks plainly low-budget. It certainly won't impress someone looking for the next Stand Alone Complex; it won't impress anyone with any other kind of complex either, because there's literally no fan service to speak of. The music isn't overly impressive either, though the opening song and overall feel of the soundtrack comes off as somehow gentle and relaxed, except, of course, during aerial combat scenes. To more discerning viewers, even the characterization might be considered a liability. Allison (Nana Mizuki, Naruto's Hinata Hyuga) almost seems to channel Haruhi Suzumiya with her impetuousness and confidence that she can do anything. Certainly, no number of her senior officers seems to be able to do that; halfway through the series, not a single one has even appeared onscreen! For that matter, Wil (Motoko Kumai, Card Captor Sakura's Li Shaoran) is generally her resigned junior partner in crime, though his marksmanship and detective skills save her bacon more than once. Somewhat more complex, but with less screen time, are the charismatic Sou Beil pilot Carr Benedict (Koichi "Spike Spiegel" Yamadera, cool as always) and the shy, retiring princess-in-hiding Fiona (a thoroughly typecast Mamiko Noto, reprising Shimako Todo and Kotori Monou and generally being prim, proper, and quiet). The characters by and large are rather simplistic, and it is clear then that this is probably aimed at a younger audience. The plot and storytelling confirm this. Occasionally Allison and Lillia comes off as a slightly less-violent 1930s version of The A-Team, with guns being bandied about, but the actual body count hovering somewhere under a dozen halfway through the story, and generally only in some tragic, overly dramatic way, even for villains. The bad guys always die, and Allison always ends up scot-free, good to fly another day until she's ready to pass the baton onto Lillia. If anything seems contrived, well, it's because it is, if only to have Allison and Wil live long enough to justify the second half of this series' title. Then there's the second half of the series, which is pretty much more of the same - Lillia (also Nana Mizuki) is a simultaneously interesting and dismaying blend of Allison's energy and optimism and Wil's cluelessness in love and emotions. Her childhood friend Treize is around to be her partner in crime, though he totes around what must be the second worst kept secret in this universe (the first being the identity of the not-so-mysterious Major Travas, a writing misstep that sadly wrecks the one true three-hanky moment of the entire series). The writing here sinks quite a bit, with a lot of frankly silly "coincidences", including a "secret agent" who gleefully breaks one of the cardinal rules of espionage (don't get involved with your past) without so much as a second thought or any particular consequences. It's clear that this universe exists simply to placate the whims of these characters and therefore the viewer is left bereft any sense of suspense or anticipation as Allison and Lillia and Wil and Treize essentially get to do the things Keiichi Sigsawa lays out for them without ever being in believable danger, but rather, just the manufactured illusion of it. So what makes this worth watching? It's that the production has a spirit to it that is somehow refreshing. There are no nihilistic antiheroes spewing great gouts of angst, just smilingly cheerful Allison and the amusingly dense boy she's obviously going to end up marrying someday. And then the amusingly dense Lillia and the boy she SHOULD end up marrying someday. There's no cleavage, no lolitas, no fan service at all, just a nice, fun, wholesome, if simple story that you wouldn't feel too embarrassed showing to your cousins. And then there's the setting and the aircraft, which are gloriously retro, and not mixed up with stupid fetishy nonsense like in Strike Witches. Allison and Lillia is simply a fun little show. As long as you don't try to think too hard, and simply let Allison (or Lillia) take you along. It's not epic, but it's cute. Recommended Audience: Older children and up, due to some violence and deaths of minor characters. There is, shockingly, no fan service to speak of, which makes this an easier recommendation for younger audiences than usual.